The final practice session started dry but dark clouds were hovering over to keep us guessing on how the qualifying would be as forecast suggested chances of rain showers. 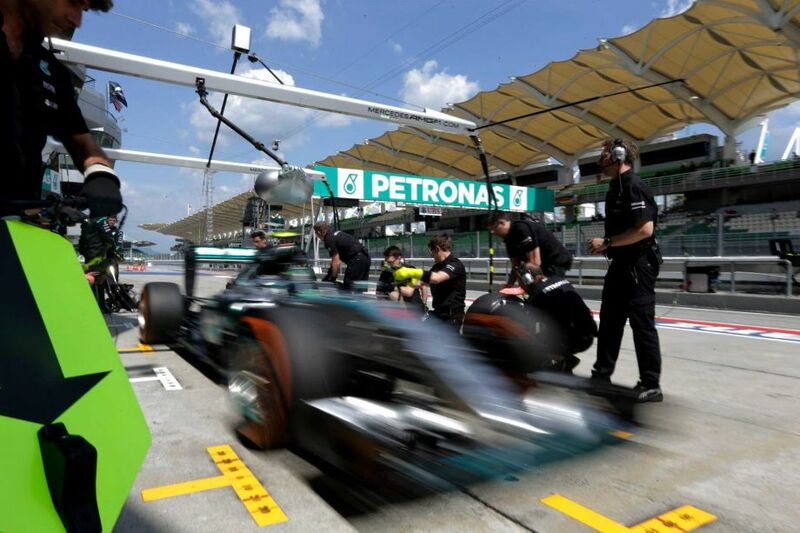 The whole hour saw drivers finding it hard to acclimatise to the every changing gusty winds and to the hot and humid nature of Malaysia of course. Before the lights went green, Button was forced to change to a newer engine because of problems with the unit he was running on Friday which now left both the McLaren drivers with only three engines for the reminder of the season. As drivers lined up for practice starts the session finally began. Manor’s Will Stevens put the first timed lap on board with a 1.49:397 before Button took his new engine for a lap around. Nasr who gave way to Marciello in FP1 went almost six seconds quicker than Will before Kvyat displaced team-mate Ricciardo by six hundredths of a second to go atop. Nasr had an early trip to gravel as he was desperately trying to make up for the lost time yesterday. Kimi was asked to comeback to the pits as a puncture was discovered in his Ferrari on his hard tyre run. With 25 minutes in, Rosberg and Massa headed out for timed laps on hard tyres while Merhi spun and was lucky to keep going. Rosberg set a lap of 1:40.392 to head the timing chart ahead of Ricciardo, Massa and Bottas. Looking strong, Vettel’s Ferrari went second fastest – one tenth down on Rosberg. Failing to hit the apex at Turn 9, Hamilton ended his first timed lap fourth though he had the purple sector 1 while Massa had a massive rear lock up moment. Far off the pace, Alonso couldn’t improve his time to languish only 11th as did Kvyat for 7th. Verstappen was complaining of vibrations from his Red Bull that might just be due to the huge lockups endured on his out lap. In the closing stages it was heavy fuel run for Ricciardo as his sector times were nowhere closer to Rosberg – 4.3 seconds off the pace on his first run and the gap increased to 5.2s the next lap. Ricciardo was alone on track as his lap times showed no improvement due to high degradation. With 10 minutes to go everyone bolted on medium tyres and headed out for race simulation runs. Massa set a lap of 1:39.690 to go second – 0.7s adrift of Rosberg’s time. Raikkonen came close to 0.5s of the German before Hamilton bumped him to third with a time nearly two tenths off his team-mate. Vettel finished fourth with a time very close to his team-mate ahead of Massa and Bottas as Ferrari managed to have two tenths advantage over Williams. Ricciardo finished seventh ahead of Carlos Sainz Jr, Verstappen and Ericsson rounded out the top 10.